Today, I received a strange email from American Express Canada about a weird redemption “I made” on a Gold Rewards Card account I manage. At first I thought it was spam or my account got hacked, but looking at it more closely, I was a bit puzzled. 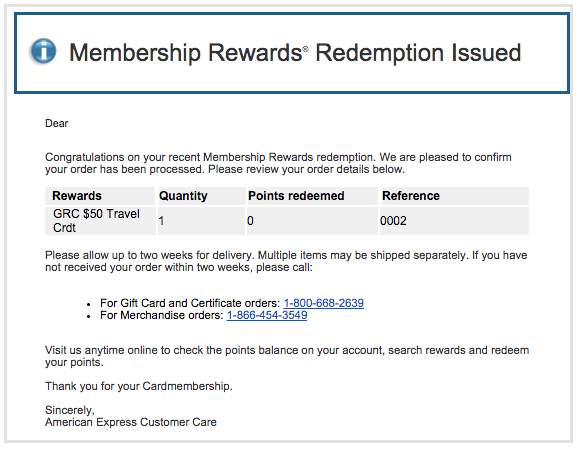 I’d never seen this type of redemption with AMEX points, so my mind started spinning. I determined that the GRC stood for the American Express Gold Rewards Card, which currently offers 25,000 points as a signup bonus and first year free.. When I realized that I got really excited that perhaps the American Express Gold Rewards Card was giving a travel credit, which was one of the benefits offered by the Platinum Card. American Express is offering a $50 travel credit for travel booked through their online site, valid until January 31, 2015! The fifty-dollar Canadian travel credit has to be redeemed at americanexpress.ca/travel, and is only available to cardholders that received the (targeted?) mailing, so check your inboxes and spam folders. The offer looks like it’s only targeted to Gold Rewards cardholders. The American Express Gold Card is overall a very strong card, with a good signup bonus, decent category bonuses, and strong benefits. The Platinum Card already offers a $200 travel credit per calendar year, but for the Gold Card to offer a similar benefit as part as well as first year annual fee waived something I’ve never seen for this category of premium credit cards. I am not sure whether new applicants will receive this offer. I hope that this promotion will be made into a permanent feature. The $50 travel credit will be applied to your statement a few days after your purchase, and can only be used once. American Express has been stepping up their marketing to attract more cardholders and marketshare, and most recently they’ve sent out a lot of “surprise” offers that are really cool, such as a Fairmont $100 Statement Credit on $500 spend I wrote about. They’ve also increased the offers on the American Express Business Gold Rewards Card, now offering a limited-time bonus of 40,000 miles and the first year annual fee waived. It is the hottest and most lucrative card to get, which I wrote about in this post. You can see the offer on the American Express website. My wife got the same offer yesterday. Thanks for explaining it as I thought it was a gift card coming in the mail . Nice to know its a travel credit! I got the same email and thought they had redeemed the GRC points to give me the $50. I phoned Amex and the CSR said the email was unclear as he had received many phone calls from concerned clients. The $50 is like a coupon for travel for booking travel through Amex, but appears as a statement credit. Does the travel credit also apply to the business gold card? Thanks for the explanation, as I got confused after receiving the credit. They’re also worried about losing Costco Canada as the preferred and only CC vendor they’d accept. I got another email today, saying the first email was sent in error. Any idea if this is happening to others, or am I just plain unlucky? I haven’t received such an email, but if you have a Gold Rewards Card, you should be eligible for the promotion, and should contact AMEX to make sure they honour the travel credit. I also received the “correction” notice after having received the initial $50 travel credit email. You may have received an email on November 3rd from American Express with the subject line “Membership Rewards Redemption Shipped”. We want to assure you that this email was sent from American Express, however it was sent in error and can be disregarded. We apologize for any inconvenience or confusion this may have caused. You can check whether you’ve received the travel credit or not by doing a mock travel booking online. If you got the credit, the travel credit will be displayed on the confirmation page.